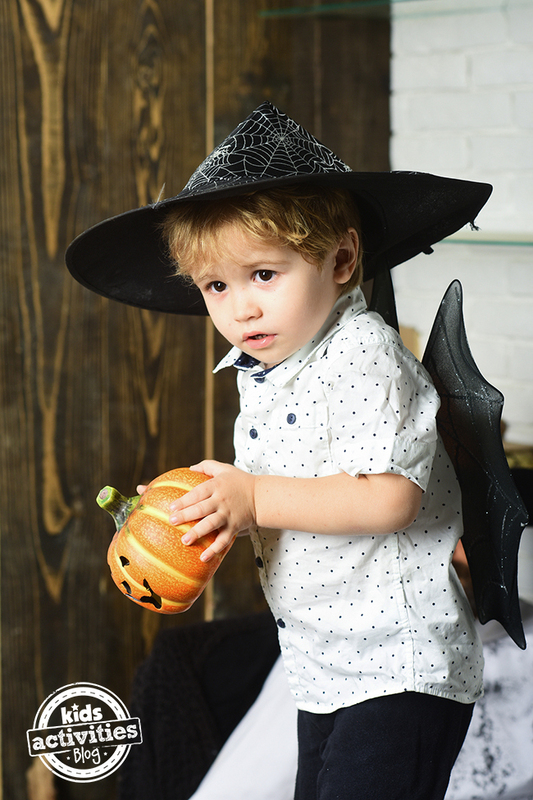 Halloween can be a spooky night for little ones out trick-or-treating! When my oldest was little, I remember getting three houses down from ours and having to turn around, because she was so scared by the ghoulish costumes worn by the older kids. Honestly, it creepy even to ME and I knew it wasn’t real. And since she didn’t know that, I can’t blame her! Since then, we spend extra time talking with our littlest ones about Halloween, so that they’re not scared when they see the costumes that other kids wear. 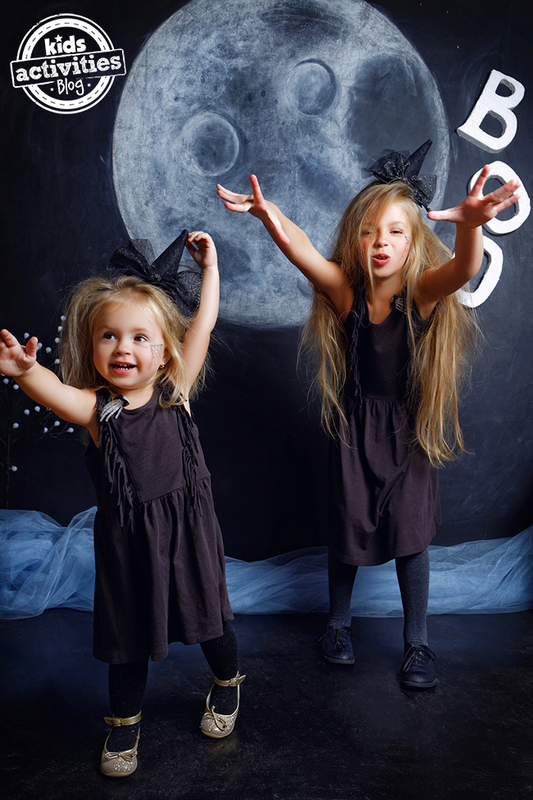 Here are some tips we use to keep our young kids from being scared on Halloween Night. As soon as we start talking about what they’re going to wear for Halloween, we make sure that we heavily emphasize that Halloween is really when everyone plays dress-up. Since the girls are familiar with the Dress-Up Station at their preschool — not to mention the bazillion costumes that they have at home — they understand the concept. We talk about how some dress-up costumes are more startling than others, but that they’re just costumes. I’ve even made a point of showing them some of the more scary costumes when we’re shopping for theirs so that they can get an idea of what they might come across. I always downplay them and make a joke about them, so that the girls see them more as funny, weird costumes vs. frightening ones. We also talk about the difference between being really afraid of someone or something hurting you and a fun fright. And that Halloween is when we play dress up for a fun fright. Last year in the store, I told the little ones to pick a mask and Boo! their dad and older sister! They thought it was super funny to see them jump in fright and then everyone laughed together. As we’re talking about playing dress-up, we also emphasize that underneath the costume is another person just like them. When they were really little, we’d play a game called Who’s Under the Costume? My oldest and I would dress up in crazy outfits or last year’s costumes and have the little ones try to guess who was underneath. They’d inevitably be able to pick out features like our hair’s color or length, our height, and even our nail polish. It taught them how to look for the person under the costume instead of just seeing the costume itself. When we go out trick or treating, we now look for the person under the costume and try to guess which one of our neighbors it is. If I see a really creepy costume coming our way, I will point it out to the girls in a silly way and point out the person under the costume before they have a chance to be startled. Perhaps the most important message we share with our kids to help them not be scared on Halloween is that we’re right there with them. I make sure I let them know that no matter what costumes we encounter, they’re safe and we’re together. We’ve also come up with a hand squeeze reassurance method — whenever they’re scared or nervous about someone, they give our hand three squeezes. That lets us know they’re nervous so we can squeeze back three times to tell them “I love you” — one squeeze per word. It’s been a great way for them to get the reassurance they need and we use it throughout the year just to say, “I love you” too. And we let the kids know that they can say it’s too much at any time. Because our kids are small. Sometimes, they ask to be picked up for a minute. For our littlest, that means having a second to reset, tucking her face into my neck so she doesn’t have to look at something that is too scary. For our middle child, that means riding on my husband’s back because he is so strong so nobody is messing with daddy. Helping little ones keep from being scared on Halloween night starts with a lot of conversations before heading out to get candy. My husband and I divide and conquer if one child is scared but the others are having fun. I will take the youngest back with me to pass out candy in the comfort of our familiar house and the rest of the kids will keep knocking on doors. If your kids really are scared, don’t hesitate to sit out the trick-or-treating. 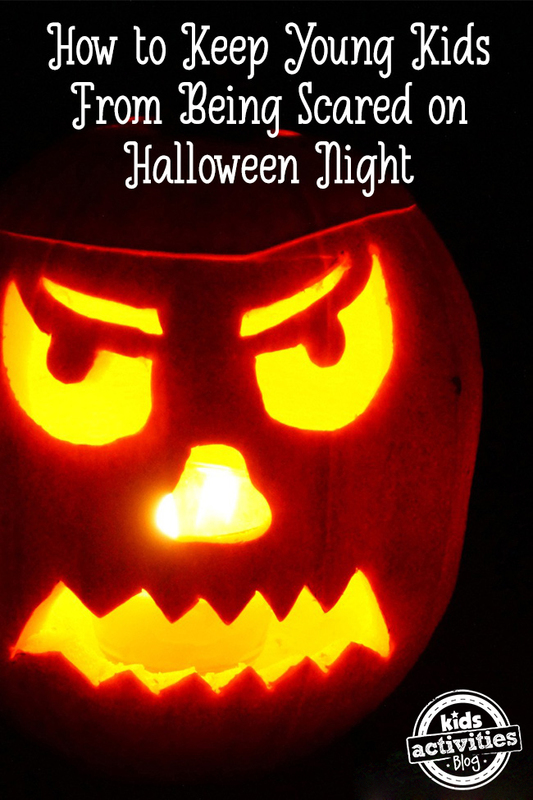 After all, Halloween is supposed to be a fun night — not one that causes them anxiety and worry! Besides, all of the candy will be half-price by the next morning.